Luce Irigray's "Zaharoff" lecture is part of an intellectual adventure begun with "Speculum". "De L'autre femme" (1974) and continued in "Ce sexe qui n'en est pas un" (1977) and "Ethique de al difference sexuelle" (1984). 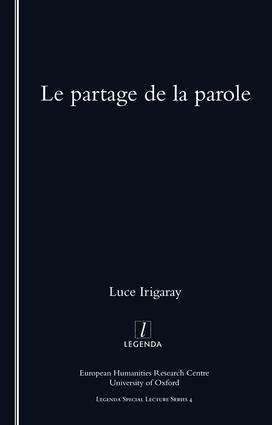 The present volume not only contains the text of "Le Partage de la parole" itself but also reprints two earlier essays that bear upon the same topic. Irigaray is a feminist philospher whose work has always had a practical dimension. In this collection, her arguments are underpinned by empirical research on the language of schoolchildren and should have wide implications not only for a range of academic disciplines but for educational policy-makers and for feminism as a political force.